Tuesday was my lovely sister, Rebecca’s birthday. This meant one thing for certain – eating cake!! After a busy day at work I was determined to whip up something special for us to enjoy post-family-roast-dinner (compliments of mum). With the frosty Melbourne weather starting to take hold, I knew everyone would need some warming up. This Strawberry and Rhubarb Crumble Tart definitely did the job. It’s gluten-free, lactose-free, low-FODMAP, fructose-friendly, and sweet enough to make you forget that you can no longer indulge in Apple Crumble. Rhubarb is a great fructose friendly option that gives baked goods a lovely tartness. Paired with something sweet, it is just delightful. I hate to admit, this was a late discovery of mine, along with many other foods I only started experimenting with after beginning my low-FODMAP diet. With a whole load of new restrictions in place, I had to find new and wonderful ways to fill the voids that fructose malabsorbtion and lactose intolerance left me with. In the last year and a half I’ve become more open to trying a wider variety of foods, and often find myself discovering delicious new ingredients. 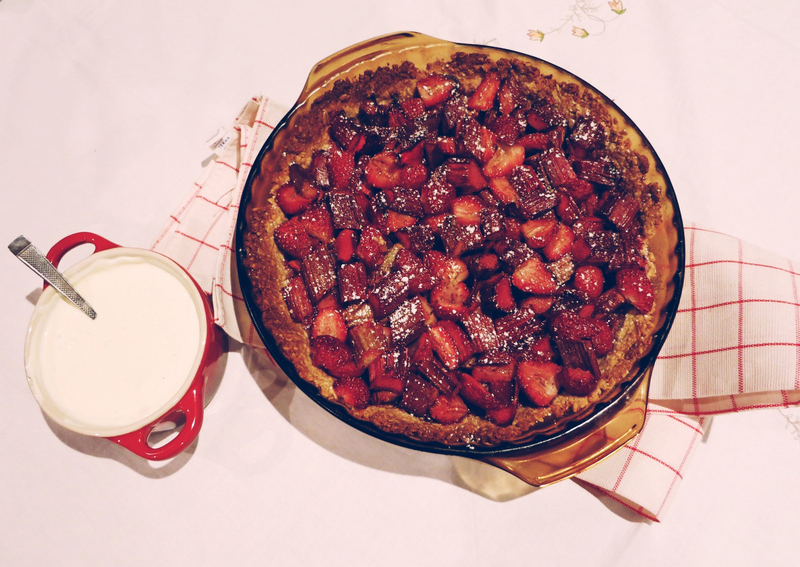 Rice malt syrup is another great discovery I’ve made along my low FODMAP journey, and is used in the crust of my Strawberry and Rhubarb Crumble Tart. A completely fructose friendly sweetener, it is made up of maltose and glucose, and is also gluten free and vegan. See here for more info. Rice malt resembles honey and can be used as a great substitute for honey, sugar or any sweetener in recipes. It’s definitely one to try. Preheat oven to 180°C and grease a 23cm pie dish or tart pan with butter. Place nuts in a food processor and pulse til roughly chopped. Add the rest of the crust ingredients and pulse til combined. Using your fingers, press crust out evenly on the bottom of the prepared dish. For the filling, prepare strawberries and rhubarb and place in a large bowl. Add corn flour, sugar, cinnamon, vanilla and lemon, and mix til all coated. Pour this mixture over the crust and dot with diced butter. Bake for 40 minutes til bubbly and crust is golden. Top with a little sprinkle of icing sugar. Serve with crème fraiche (if tolerated), combined with a teaspoon of caster sugar and the beans from half a vanilla pod. This is so sweet and perfect and lovely! I've never cooked with rhubarb…not even sure if I've eaten it before. But I always love the look of it, especially the bright pink color it gives everything. Just beautiful!